Peanut Butter Fudge topped with Reese’s Peanut Butter Cups! 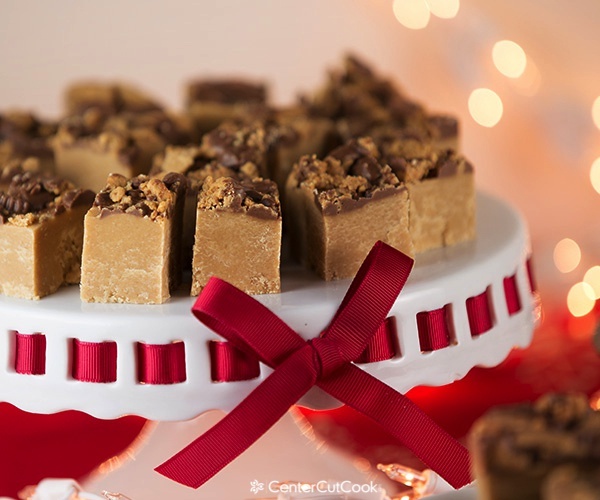 An easy no-bake recipe for creamy peanut butter fudge! The holiday season is here which means many of you will soon be in the kitchen making cookies and brownies to share with friends and family! 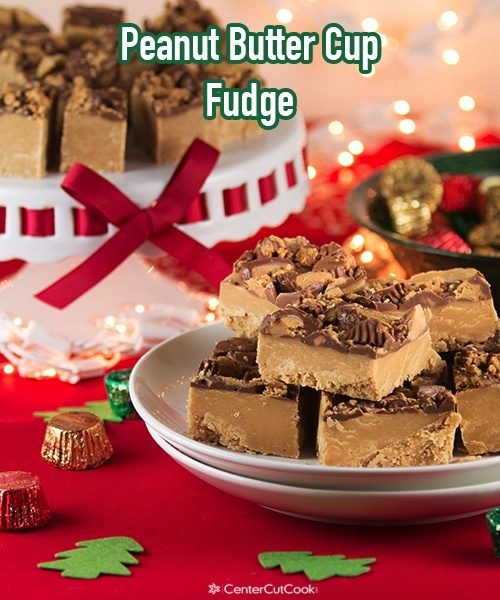 Today I am sharing one of my favorite no-bake treats for Peanut Butter Fudge topped with Reese’s Peanut Butter Cups! Creamy, decadent, delicious! Easy Peanut Butter Cup Fudge is a fabulous alternative to brownies or cookies because it’s easy to make and always a favorite! Along with my recipe for Peanut Butter Cup Fudge, I’ll be sharing some tips on how to host a holiday cookie swap or exchange! Have you hosted or attended one before? It’s an awesome way to simplify holiday baking, without sacrificing variety. Everybody loves a variety of cookies to choose from, right? I don’t know about you, but there are a handful of recipes that I only make during certain times of year. Take for example, fudge! When I’m putting together my list of Christmas baking, fudge is always on the list, and despite the fact that it’s super simple to make because it’s a no-bake recipe, I never make it any other time of the year. This fudge is fabulous for so many reasons. Did I mention it’s no-bake? I did? The fact that this fudge requires no oven makes it a favorite. I love recipes that i can quickly assemble, without having to babysit trays of cookies in the oven. This fudge fits that bill! Topped with Reese’s Peanut Butter Cups, this Reese’s Peanut Butter Cup Fudge goes from amazing to out of this World! For that reason, it’s one of the recipes I tend to bring to holiday cookie swaps and exchanges. Have you ever hosted or attended one before? Cookie swaps are wonderful because they give you the opportunity to socialize with friends, while also getting an assortment of cookies. The gist of it is this: Invite your friends to come over bringing several dozen of one kind of cookie. 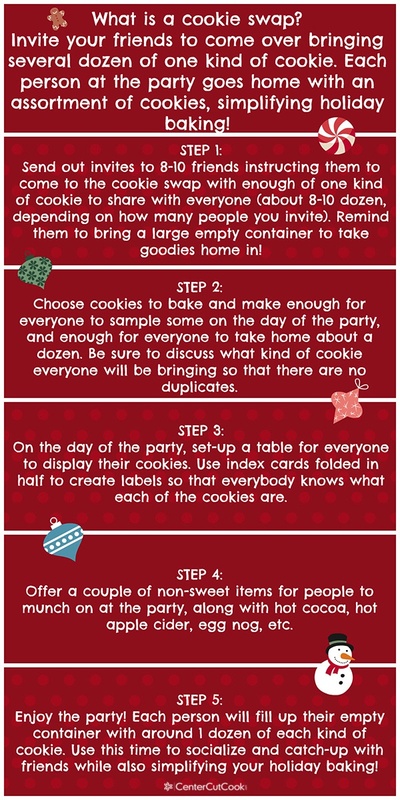 Each person at the party goes home with an assortment of cookies, simplifying holiday baking! 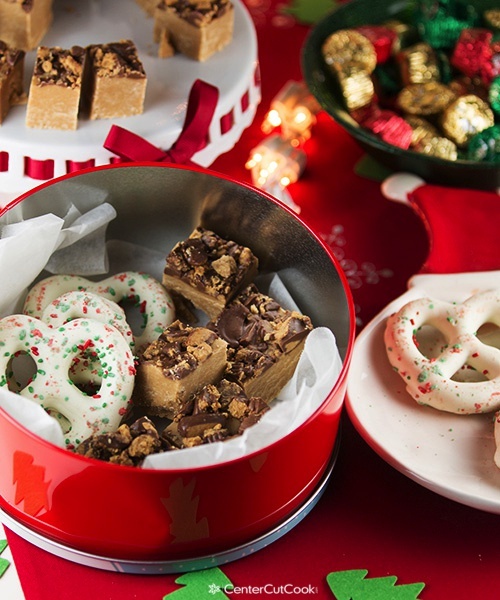 If you decide to host a holiday cookie swap and you need ideas for some non-sweet items for people to munch on, I’ve got a couple fabulous options for you. Pizza Dip – cheesy, gooey, delicious! Warm Spinach Artichoke Dip – creamy, cheesy, made with four different types of cheese! BLT Wraps – crisp bacon, juicy grape tomatoes, shredded lettuce, and a special sauce rolled up in tortillas! Be sure to remind guests to bring an empty container for all of their goodies! I like to use tins or air-tight containers so that the cookies stay fresh. 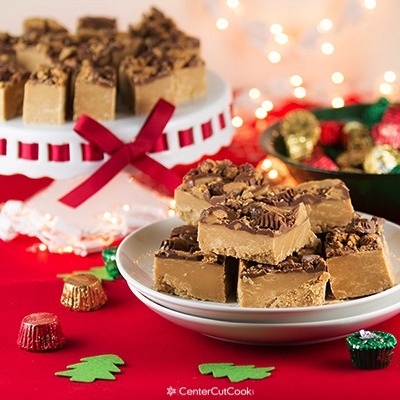 And now, here’s the recipe for decadent Easy Peanut Butter Cup Fudge! 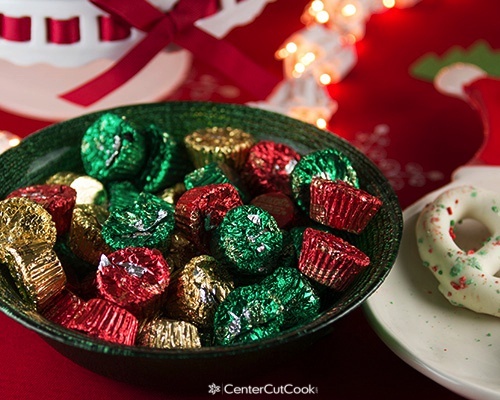 Without a doubt, you will want this one your list of holiday treats to make this year! Enjoy! Line an 8 x 8 pan with saran wrap so that it will be easy to lift the fudge out of the pan. In a large saucepan, melt butter over medium heat. Stir in brown sugar and milk. Bring to a rolling boil, then cook for exactly 2 minutes, stirring frequently. Stir in peanut butter and mix to combine. Then add in vanilla extract. Transfer the mixture to the bowl of your mixer. Add in sifted confectioners sugar, one cup at a time, mixing between adding more. After you’ve added all of the confectioners sugar, mix well! The mixture is going to be really thick. Press the mixture into the prepared dish. 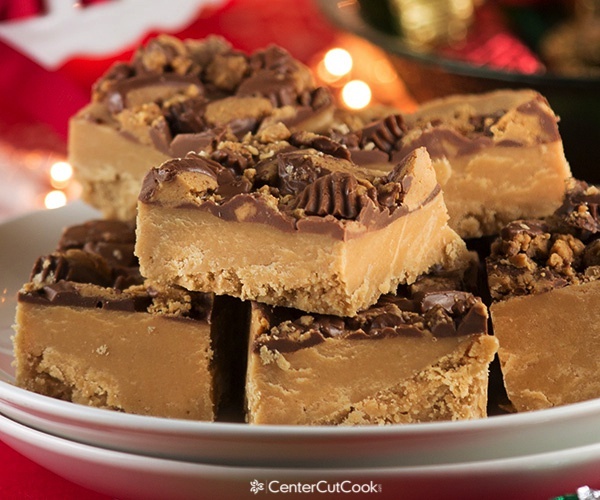 Sprinkle chopped Reese’s Peanut Butter Cup Miniatures over the fudge and gently press them down. Chill in the refrigerator for about an hour, or until firm, then use the saran wrap as handles to lift the fudge out of the pan and cut into small squares.